I want to begin this week by sharing the announcement made today that the Holy Father has accepted the resignation of Bishop Arthur Kennedy, who earlier this year reached the retirement age of 75. 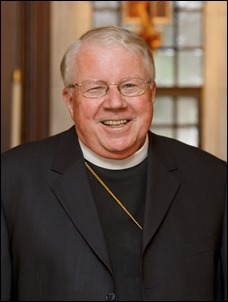 We are so grateful for the many ministries that he has been so dedicated to in his time as rector of St. John’s Seminary and as Auxiliary Bishop of Boston. We know that in his retirement he will continue to help and be present in various pastoral ministries of the archdiocese. We are very grateful for that, and wish him many blessings and good health in his retirement! 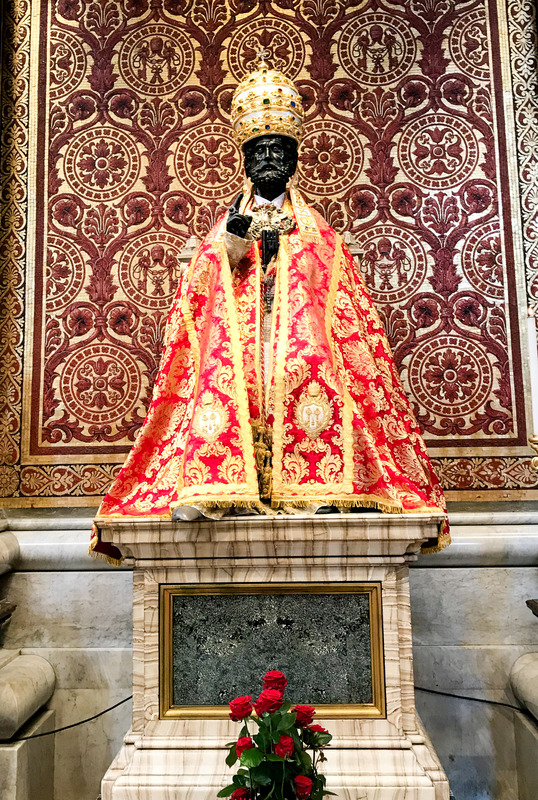 This week, I was in Rome to participate in meetings of the Congregation for the Doctrine of the Faith and to be present for the consistory that was held on the eve of the Feast of Sts. 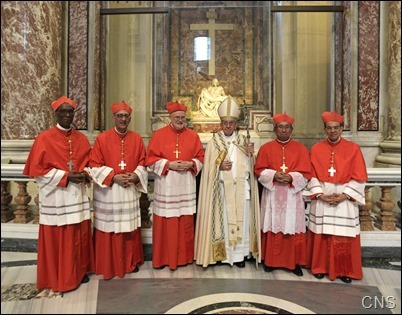 Peter and Paul in which the Holy Father created five new Cardinals. 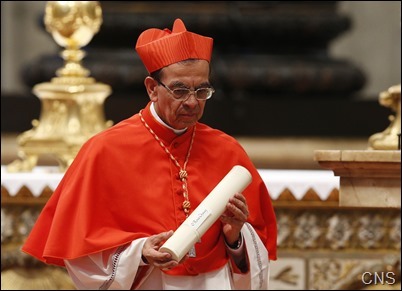 A number of these new cardinals come from countries that had never had any representation in the College of Cardinals previously, including Bishop Gregorio Rosa Chávez, whom I have known for over 40 years. He was the rector of the Seminary of San José de la Montaña in San Salvador under Blessed Archbishop Romero, and subsequently was an auxiliary bishop for three consecutive archbishops. 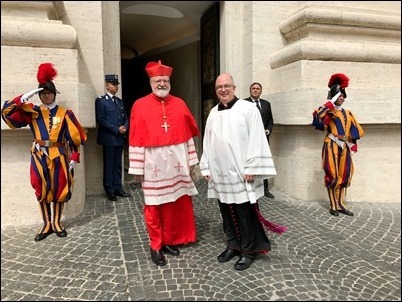 It is a very unusual occurrence that an auxiliary bishop would be named a cardinal, but there is something very biblical in the way that Pope Francis sometimes chooses the “younger son” — like the Lord chose David over his older brothers, or chose Isaac over Esau. Certainly, the Holy Father is full of the surprises! 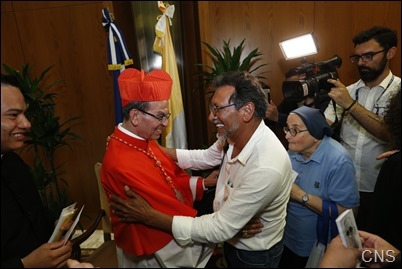 I know there was great enthusiasm among the people of El Salvador at his becoming cardinal. 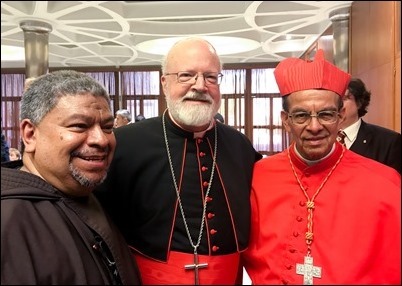 Of course, during my 20 years in Washington, D.C. most of my parishioners were Salvadoran, so I was very happy that about 50 Salvadoran priests and 200 Salvadoran people were able to journey to Rome to be a part of the celebration and accompany Cardinal Rosa Chávez. Among them was Father Moises Villalta, a Capuchin who had been a parishioner of mine and whom I ordained, and is now pastor of Sacred Heart Shrine in Washington. He is also a close friend of the cardinal, so it was wonderful that he could be with us. 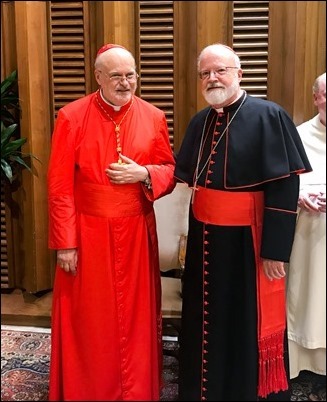 It was also very interesting to see that the Holy Father named the first Swedish cardinal, Cardinal Anders Arborelius, who is, in fact, the first cardinal of any of the Scandinavian countries. I think that his presence will help to raise the profile of the Church in Sweden and the rest of Scandinavia. 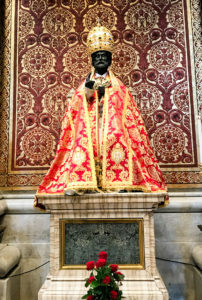 The Cardinal told me that he has a sister living in Gloucester, so I invited him to visit us in Massachusetts sometime! 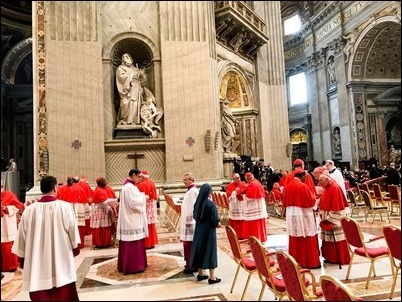 In his selection of new cardinals, the Holy Father is truly going to the periphery and showing us the catholicity of the Church by underscoring the fact that the Church is not just European or North American, but that there are many parts of the globe where the faith is flourishing. 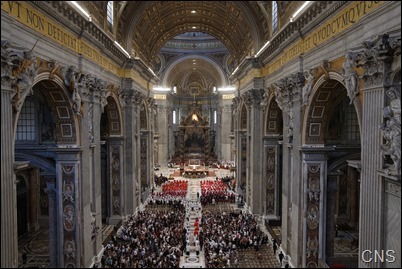 Perhaps in some places there are fewer Catholics, or they are in very challenging circumstances, but they are all an integral part of the Church. 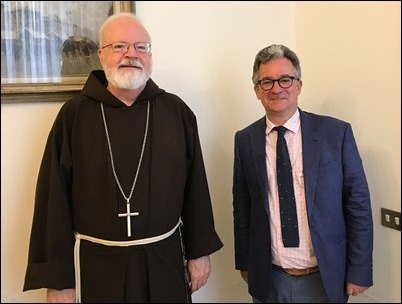 While I was in Rome, I met with Austen Ivereigh, the British author and journalist who is a co-founder of Catholic Voices. He came to talk with me about a book he is writing on the Holy Father. The consistory was held on Wednesday, and that evening, I had dinner with friends of mine from Honduras, Leonardo and Marta Casco, who worked very closely with me in the pro-life movement in the past and are truly champions of the Gospel of Life in Honduras today. As I mentioned, it was the eve of the Feast of Sts. Peter and Paul. 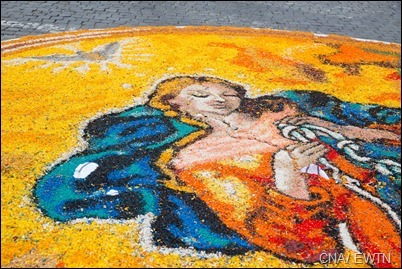 So, coming back from dinner, we saw the people gathering on the Via della Conciliazione, the huge avenue leading to St. Peter’s Square, creating images of religious scenes made with flowers, which is a tradition for the feast. 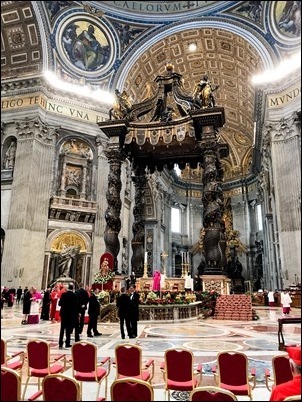 Within St. Peter’s Basilica itself, they have the statue of St. Peter dressed in the papal tiara and robes and at the end of the consistory the Holy Father went and kissed the foot of the statue, a practice followed by pilgrims for centuries. In fact, the foot of the statue is being worn away by so many people touching and kissing it. 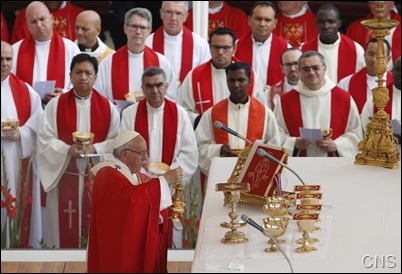 On Thursday, the day of the Feast, the Holy Father celebrated Mass in St. Peter’s Square. At that Mass there were delegates from the Phanar in Constantinople, representing Ecumenical Patriarch Bartholomew. In fact, last year the Patriarch sent our own Metropolitan Methodius as his representative. 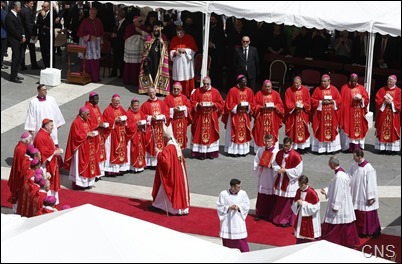 This is the same Mass where the archbishops who are receiving the pallium gather, including, this year, three Americans: Cardinal Joseph Tobin of Newark, Archbishop Paul Etienne of Anchorage and Archbishop Charles Thompson of Indianapolis. 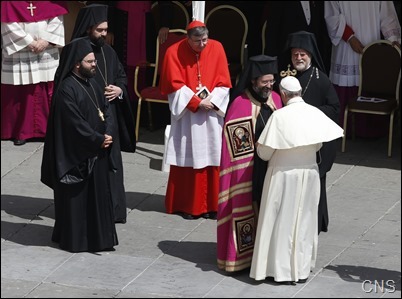 Mirroring this exchange of delegations between the Holy Father and the Ecumenical Patriarch, in our own archdiocese for many years we have had the practice of exchanging delegations with the Greek Orthodox on the Feast of St. Andrew and the Feast of Sts. Peter and Paul. 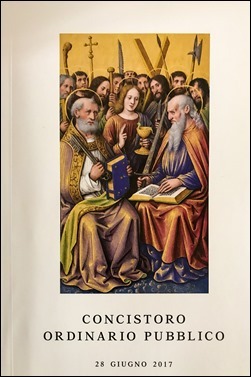 Of course, Peter and Andrew were brothers, and St. Peter is credited with founding the Church in Rome and St. Andrew is credited with founding the Eastern Church. So, it’s very significant that on their feast days we come together. 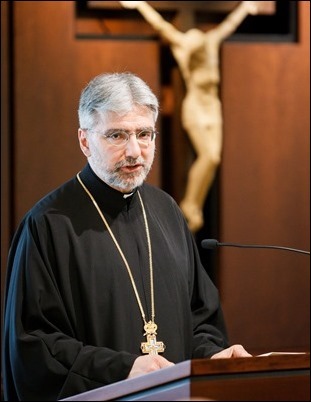 In Boston, on St. Andrew’s Day, I attended the Vespers Service that his Eminence Metropolitan Methodios celebrated at their Pastoral Center, and so he reciprocated by sending Father Demetrios Tonias, Dean of the Annunciation Cathedral, as his representative to the Mass for Sts. Peter and Paul at our Pastoral Center yesterday. We are very grateful for his presence. 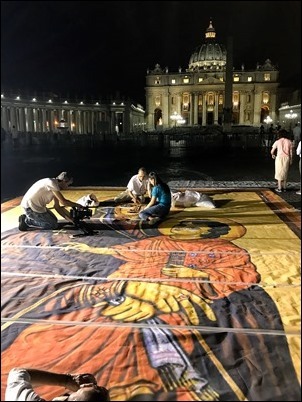 This is a very important gesture that underscores the desire among Catholics and Orthodox for greater unity and closeness. 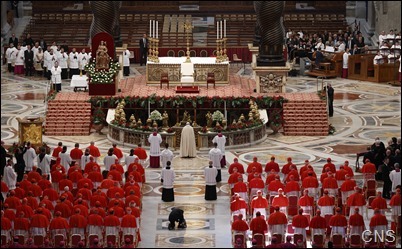 We all pray for the establishment of that unity that existed between our Churches for the first 1,000 years of Christianity.